The past few years—and even the past months—have seen an explosion of new eating options in downtown Sugar House, the few square blocks with an epicenter at 2100 South and Highland Drive. Now that most of the dust has settled and the construction cranes have vacated the neighborhood, it's beginning to look like a thriving new cosmopolitan center—especially as regards dining destinations. From fancy, cloth-covered tables to fresh fast food, hungry Sugar House patrons now have a dizzying array of eateries in which to tie on the old feed bag. The question is, I suppose: Which ones will still be here a year from now? Before I turn to the new kids on the block, I'd be remiss if I didn't give props to some of the pioneers who helped make Sugar House 2.0 possible. With all the shiny new eateries, it's all too easy to forget the folks who forged the way. Rocky Mountain Grill, Salt Lake Pizza & Pasta, Fiddler's Elbow, Fat's Grill, Tsunami, The Formosa, Hunan Garden, Sugarhouse Barbeque, Yanni's, Este Pizzeria, O'Falafel, Blue Plate Diner, Michelangelo (now Omar's) and others blazed a culinary trail in Sugar House that has allowed the new renaissance of that neighborhood to flourish. We should keep in mind and continue to support these longtime, established, independent Sugar House businesses. That said, let's take a look at some of the newer ones. With so many restaurants to write about, I've decided to do so in two parts. This week, I'll focus on Kimi's Chop & Oyster House and Bruges Waffles & Frites. I remember a time when Bruges Waffles & Frites owner/founder Pierre Vandamme operated from a food cart at the Downtown Farmers Market. Eventually, he opened his first brick & mortar store, on 300 South in downtown Salt Lake. Now, there's also a Provo location, the roaming Waffle Bus food truck, and the Sugar House eatery (2314 S. Highland Drive, 801-486-9999, BrugesWaffles.com), which is a couple of years old and features the biggest Bruges menu and selection. At Bruges Waffles & Frites' Sugar House store, you'll find well-known items like Belgian-style fries with a multitude of saucing options, heavenly Liège waffles and the popular Machine Gun sandwich, as featured on the Travel Channel's Man V. Food. But there is so much more. Like waffle sandwiches ($7.99), for example. Yep, it's a sandwich made with toasted waffles where you'd normally expect to find bread. There's a veggie version; smoked salmon; an Italian-style sammich; one with curry-lime tuna; a turkey, bacon & avocado; and a club sandwich. Even more interesting, in my opinion, are the unique omelets ($6.99-$8.99). 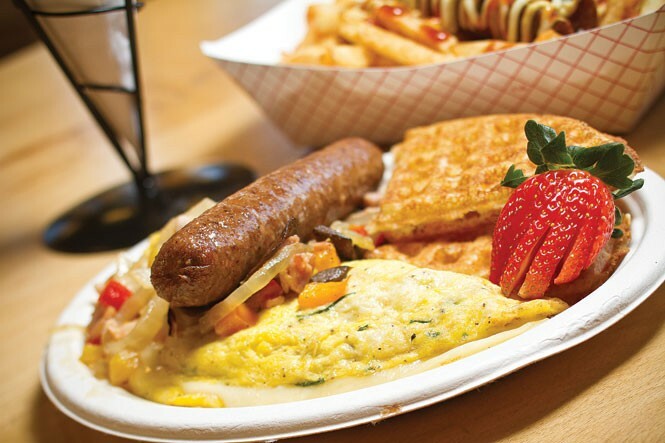 The Averell omelet, for instance, is eggs with Brie, ham, roasted bell peppers, caramelized onions, portobellos and a choice of either one "freakandel" or two merquez sausages. The "freakandel" is a play on frikandel, a Belgian and Dutch deep-fried, skinless, chicken-pork-beef sausage. You can also get the freakandel in a hot-dog-type bun ($9.25), or naked, topped with frites. My ultimate wish is that someday Van Damme will open a full-blown Belgian restaurant serving dishes like waterzooi, tarte au riz, filet Américain, lapin á la gueuze and moules-frites. But for now, Bruges Waffles & Frites serves my Belgian cravings admirably. At the opposite end of the Sugar House price spectrum from venues like Melty Way, Masala Grill, Habit Burger, Pho Thin and such is Kimi's Chop & Oyster House (2155 S. Highland Drive, 801-946-2079, KimisHouse.com). I've known Kimi Eklund for many years, dating back to the restaurants she opened with her then-husband Staffan—Absolute!, Dijon and Kimi's Mountainside Bistro at Solitude—and I wish her well in her newest endeavor. I just hope that fine dining isn't a thing of the past, because Kimi's is certainly a fine-dining restaurant, one with warm hospitality and friendly charm. Kimi is nothing if not stylish, and as I expected, her new restaurant—in the space that was formerly Caterina—is a feast for the eyes. The modern bar with its LED "fireplace" pulls the eye to the center of the restaurant. It's a terrific place to enjoy a signature cocktail and nosh on fresh oysters on the half-shell ($3/each), baked mussels with herb butter ($12), or try a plate of toast smogen ($14), a Swedish crostini-type affair with shrimp, crab, dill, horseradish crème, fresh lemon and caviar. It's a dish that's made the trek from Absolute! to Sugar House. I have to admit being disappointed in Kimi's' avocado shrimp appetizer ($10). It's not that I didn't love the flavor of the shrimp perched atop cucumber rounds with fresh avocado, soy glaze and garnished with sesame seeds and tobiko. It's just that for $10, I'd expect more than a mere three medium-sized shrimp—jumbo shrimp, at the very least. While not exactly a bargain, a better buy was cashew-crusted sea bass ($32). It's a delicious dish, though the presentation doesn't hit the high notes that Kimi's décor or excellent service do; I thought we'd gotten past stacking food atop more food. In this case it was leek-butter sauce topped with whipped potatoes, followed by a perfectly seasoned and cooked sea bass filet, with asparagus, dill and microgreens at the zenith, with dollops of lingonberry chutney strategically placed in four quadrants of the plate. Sliced bavette steak ($30) served with a rich port reduction, asparagus, roasted garlic and (by request) pommes frites was tender and tasty, if predictable. Not so predictable were the frites, which I'd expected to be standard french fry size. Instead, these were big, thick wedges of the sort I normally loathe. However, Chef Matt Anderson cooked these spud slices to perfection, somehow managing to make them crisp on the outside, but not mealy or undercooked inside. It's the first wedge fry I've ever loved. Tune in soon for reviews of new Sugar House brewpubs and pizzas.